This was the first time I’d ever tried the iconic American spread, Marshmallow Fluff. It was a favourite of John F Kennedy apparently and was invented as long ago as 1917. Ooey, gooey and very sticky , it was so much nicer than I was expecting it to be. Granted it’s very sweet, but it transported me straight back to childhood, where as a very occasional special treat, I was allowed strawberry instant whip. Like instant whip, it makes no bones about being natural. It boldly proclaims “artificial strawberry flavour” on the label. As for the white marshmallow fluff, I’m saving that to top some hot chocolate when I’m feeling particularly decadent. Put it on your cakes, in your cakes, spread it on toast, it can be used for any number of things, not least eating straight from the jar with a teaspoon. In fact I’m having a very hard time, not polishing the whole thing off. Unlike marshmallows, Marshmallow Fluff does not contain gelatine so it’s vegetarian friendly. Sadly for vegans the ingredients do include egg whites though. With Thanksgiving fast approaching, 26th November, I wanted to make something to celebrate the day and what could be more American than Marshmallow Fluff and cookies. My first thoughts were to make cookies then sandwich them together with the Marshmallow Fluff. However, in honour of the special occasion, I decided to push the boat out a little and bake cookies with the Marshmallow Fluff already inside. As it happened, I had a bar of strawberry flavoured chocolate to hand, so that was chipped and tipped into the mix as well. The result was sweet and flavoursome – cookies that were crisp on the outside and chewy in the middle, just like the genuine American article. I was hoping for a gooey marshmallowy centre, but the chewy one I got was so good, I reckon it would be hard to improve on it. 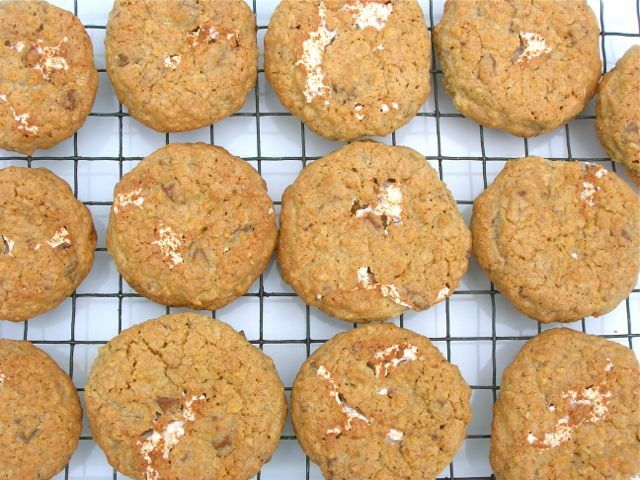 A very moreish crisp on the outside, chewy in the middle type of cookie. Strawberry flavoured chocolate bits and gooey strawberry flavoured Marshmallow Fluff in the middle make them a real crowd pleaser. Sieve in the flour and baking powder, then add the oats and stir until just mixed. Roll teaspoonfuls of the mixture into balls and place half, well apart, on a lined baking tray. Press a dent into the middle as if you were making thumbprint biscuits and fill with the marshmallow fluff. Make a thumbprint in the remaining balls and flatten them slightly as you go. Place over the cookies on the tray, covering the marshmallow fluff and seal the sides with your fingers. Bake at 180C for 12-15 minutes depending on how crunchy or chewy you like your cookies. They should be just turning golden. Can easily be adapted to use plain, milk or white chocolate and original marshmallow fluff. M is for Marshmallow Fluff, the chosen letter for Alpha Bakes this month. Hosted alternately by The More Than Occasional Baker and Caroline Makes. This autumn has been pretty miserable so far, so dark and dismal. Sweet treats are definitely needed to perk things up, so I’m sending these strawberry Marshmallow Fluff cookies to Treat Petite where the theme is Autumn. You’ll find it this month at The Baking Explorer, otherwise at CakeyBoi. This is a commissioned post. Opinions are, as always, my own. Mmm these look delicious! 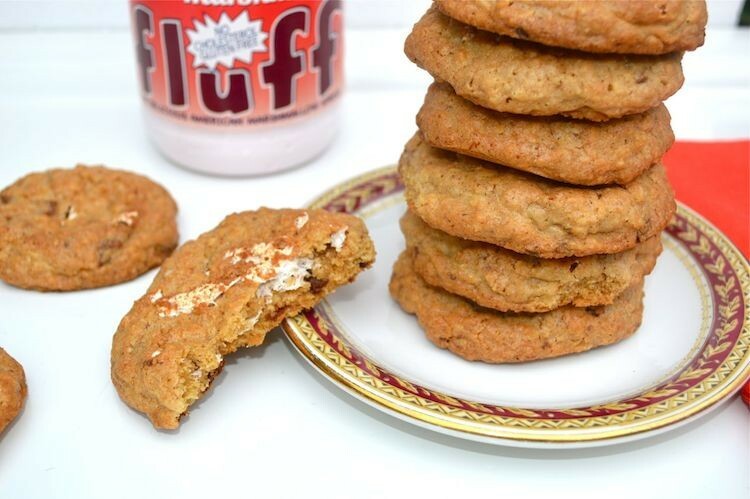 I love marshmallow fluff but never thought of putting it in cookies – will have to try! Thanks Diana, what a lovely thing to say. I’d like to have a go at making my own too. sounds lovely. I’ve only used marshmallow fluff in buttercream type fillings before but will give this a go! It was new to me in any way shape or form Roz – so naughty, but so nice! It is super sweet stuff Helen, so definitely not something for every day, but as an occasional treat? Mmmm! The strawberry marshmallow fluff is such an interesting addition. Wish I could have one with my tea now. These look fantastic. I’d never considered adding marshmallow fluff to a biscuit batter. Now I want to try the strawberry version as I’ve only tasted the plain. I haven’t tried the strawberry flavour yet, must remedy that ASAP. Will be adding some to my hot chocolate and these cookies would go very well! These sounds lovely. I’ve always wanted to try Fluff, but never get round to it, must chnge that! It was a first for me Jemma – very sweet, but well worth trying. What an interesting recipe…in a good way! I wouldn’t have thought of this combination when planning a cookie, but I can really see how it would be delicious. I’ve never tried strawberry marshmallow fluff, so I’m going to be on the lookout for it in stores. Thanks for sharing! Thanks Kathrina. Because fluff was new to me, I didn’t have any concept of what’s normally done with it, which I guess is quite liberating in some ways. Literally about to lick the screen as these cookies look and sound amazing! What an awesome idea and they’d go great with hot chocolate right about now! How fun! I’ve really only every used fluff for fudge. But I bet it’s fabulous for cookies! Oh fluffy fudge, now that does sound interesting Whitney. Wow, never considered fluff as a baking ingredient, I’ve only had it on sandwiches when I was a little kid. Theses look absolutely scrumptious! Thanks Michelle. Fluff is new to me, I’ve never had it on bread. It did work very well in these cookies though. I have never ever even heard of the concept of marshmallow fluff – and now all I am thinking about is I need to try some. Yum cookies too. I think it’s interesting that marshmallows and marshmallow fluff are always in the American section of the grocery. It wasn’t something we ate a lot of when I was growing up in Maryland, except the occasional s’more. Maybe it’s popularity is a regional thing(?) It is good, in a weird way. I love the little bits of fluff peeking out of your cookies. Thanks Lydia. That’s interesting, we think of it as being soooo American. I have a secret addiction to marshmallows. I didn’t grow up with them and only discovered them later in life but.. it was love at first sight! There is something about them that’s irresistible! Love your recipe, bookmarking, thanks! Thanks Alida. I think I fell in love with marshmallows when we were travelling in NZ, many years ago no. We attended a party, where the main fun was toasting marshmallows outside over a fire – I was in heaven. Like Alida, I have a secret addiction to marshmallows (ssshhhh…. don’t tell my husband…. I wait until he goes to bed or is away and then sit with a large bag and munch….). My daughter loves the fluff…. I find it a bit sweet and over-sticky on its own (despite my love of the soft squelchy sweet variety), but I could definitely find a place for it in cookies!!!! These sound very naughty and very yummy…. love the fact that they are soft and chewy. Reckon they might work with a straight substitution of GF flour…. what do you think? Haha Kate, I’m picturing you hiding the bag now 😉 I have to say this marshmallow fluff is very sweet, as are the cookies, but sometimes sweet is OK. I don’t see why they wouldn’t work with GF flour, but I think you’d know better than me. These look ludicrously good! They remind me of the pillow cookies sold at my local Fresh Market. never imagined this goodie was possible. yummmmmmmy! I’ve had the vanilla fluff before and never thought of putting it in cookies, great idea! Thanks for entering into Treat Petite. Marshmallows and cookies! I have never thought of that before, what a great idea! These sound really yummy. I’ve never had a cookie with fluff in the center before. How fun! Thanks CC. I was hoping for the fluff to remain fluffy inside, but the chewiness I actually got was pretty good anyway. just coming back to these cookies…. they are stupendous. Am making them today… will report back! Ooh, how exciting. Crossing fingers, they go OK Dom. I have never tried fluff, I always wanted to when I was a kid though 🙂 My husband would love these – he is a huge fan of strawberry flavoured everything, this would be right up his alley! Thanks Donna. I’d never tried it until now either – not sure what my excuse is! What a great combination, these cookies sound delicious! Those cookies look wonderful. We always used the marshmallow cream for fudge. I’ll have to try it with cookies too. Ooh goodness, I never thought about fudge Marisa. Just trying to imagine how good that must be. Marshmallow fluff scares me a bit but these look delicious! I know what you mean Alex, especially as it could become rather addictive. Hi Ros, they were totally delicious. Thanks for picking up on my time travelling, no-one else seems to have noticed!